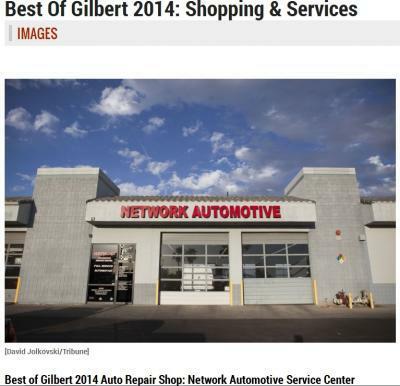 Many thanks to all of you who voted to make Network Automotive the best repair shop in Gilbert! The crew at the Gilbert location of this ASE-certified, full-service auto repair and maintenance chain gets high marks from online reviewers for fast, friendly service and a habit of not upselling customers on services a vehicle doesn’t really need. In addition to brakes and alignment work, Network does a/c repair and maintenance, emissions, lift and lowering kits, transmission repair, and diesel service and repair. It offers a 24-month, 24,000-mile nationwide warranty, and work is backed by a 100-percent satisfaction guarantee.